If there’s one thing anime’s taught me, it’s that the entire world is essentially a den of lies and you should never ever trust anything or anyone! I lead a real fun life. It therefore goes without saying that you shouldn’t trust any anime characters but these 5 archetypes are particularly not to be trusted as they are the worstest. My grasp of the English language has slipped in the face of such duplicity. Yeah…that’s what happened. I write this post because I care for you. Should you ever find yourself transported in an anime world, literally or figuratively, you need to watch out for these guys! Yes yes, I know they look all sweet and innocent. And in certain genres of anime, they are. But for the most part, those adorable innocent looking little girls are as likely to leave you broken and bloodied as anything else. Those little bodies hide some sharp tongues and unbelievably strong muscles which both of which they are not in the least bit afraid to use. I’m not sure why so many lolis seem to have a sadistic side. Maybe it’s just because they can get away with it. But whether it’s through psychological torture, devastating insults or a good old fashion beating, yo will regret ever getting on the bad side of this character. Oh and they tend to snap at the slightest provocation so you’re pretty much certain to get on the bad side of this character. Better play it safe and stay away all together. You just can’t trust your eyes on this one! I’ve told you this before, never ever trust Aki…I mean a white haired boy. Sure, they look all angelic and not unattractive. I bet they’re pretty smart too. But all that white is just trying to cover up a black black soul! In the best case scenario, your new white haired friend has such deep rooted psychological trauma, he’s likely to loose it at the worst possible moment and doom you all. More likely though, he was never on your side to begin with. This handsome young man has plans of his own and if you don’t happen to play into those, well there’s no need to keep you around, or necessarily alive. 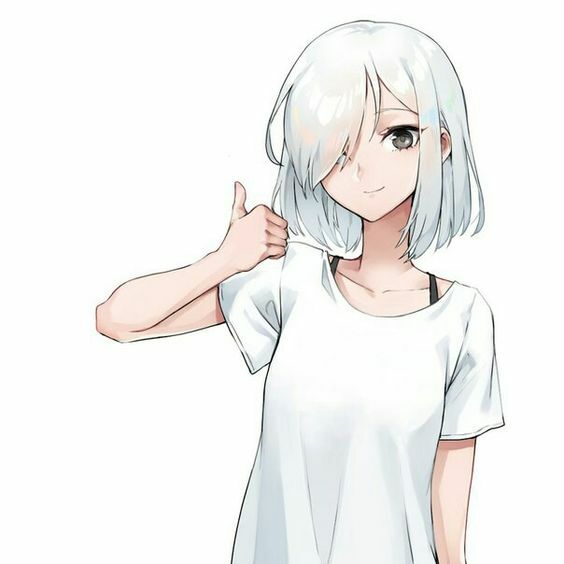 Take my advice, if a white haired boy takes an interest in you for any reason, divert his attention by introducing him to the closest loli and get your behind out of there. Things are about to get…eventful. I love a good smile. I find a warm and honest smile to be one of the most attractive features a person can have. But even I get a touch uneasy around people that just smile all the time. They have resting smile face. You can bet that a smile that never fades isn’t genuine and why would someone want you to think they’re happy all the time? For nefarious reasons, that’s why! You meet that nice anime person once and they have a sweet welcoming smile, great. You meet them again and that same smile is plastered on, well o.k. You’ve known them for a month and it’s the only expression they seem to make? Run! Run far, run fast, run now! Nothing good can come of this, believe me. They’re gonna be mean to you…. I don’t know what it is but sooner or later, those glasses are going to reflect the light in such a way that you can’t see their eyes and then they’re going to just rip into you. I get it, glasses are cute and people who wear them are cute too. I assure you, I completely understand this reasoning. And you might be thinking to yourself, it’s worth the risk. My glasses boy and or girl would never turn on me. They’re so gentle and kind! If you take nothing else away from this blog then take this: never ever trust Kyubey! Really, you should keep your guard up with any adorable sidekick. Even the generally benevolent ones are likely to get you in trouble, eat all your food and generally make a pest out of themselves. and the benevolent ones are rare! Basic rule of thumb when trapped in an anime is to be suspicious of anything overly cute really. But if it happens to look helpless and unable to think for itself on top of it, you are in deep trouble. I wish I had some advice for you but the sad fact is, if you’ve even just spotted Kyubey (or equivalent cute critter) it’s probably already too late for you. Might as well start racking up those karma points for the next life. And on that super optimistic note, I conclude my list of anime character types you should never trust. Of course there are exceptions to every rule. I’m sure there’s a perfectly sweet bespectacled always smiling loli with an adorable white haired brother and they’re perfectly nice puppy fox out there somewhere. But ask yourself folks, is it really worth the risk? Actually don’t ask yourselves, ask me instead. I know the answer, and the answer is NO! So tell me guys, have I missed any prominent archetypes we should be watching out for? Share them in the comments, we need to keep each other safe! everything is going to be ok…nothing to worry about… wait that kid has glasses…. That comment was aimed at ManInBlack. Huh? Sorry, I haven’t seen all of the Buffy the Vampire episodes because they took it off Netflix… Shame too. I liked it. Satan ought to be portrayed as a platinum blonde. Of course, there was Spike in Buffy. Maybe so did Satan. Compare the story of Lucifer with Prometheus. My theology is spotty but did either ever get officially redeemed? Hercules redeemed Prometheus. Lucifer is not so lucky. Now, I’m imagining the TV show called “Devil is a Part-Timer.” It’s on Netflix. Well, the Devil is a Part-Timer used to be on Netflix (until something this month, I think). It shows the relative attitudes towards knowledge of the two cultures. Yes! I knew the white haired boy would end up on a list like that. I remember having a conversation a long time ago with an anime fan friend and we’re saying “How is it that the white/gray haired guy is ALWAYS evil?” when I first experienced watching Naruto. Haven’t seen that one, but I’ll take your word for it. Gotcha. We’ll see what happens. Hahaha! Careful, Kyubey may have all of us make a contract with him! And we probably would… Curses Kyubey! Huh….??? Who are we talking about? Well, he’s not exactly a “boy”, but there is Desty Nova. true. Guys, stay away from beautiful girls with huge chests. that should do it! HEHEHEHEHEHEHEHEHEHEHE!!! Funny advice! Though I’ve never really met a girl with a huge chest other than fat girls… not meant to offend anyone and I’m sorry if I do offend anyone. Your name on here reminds me of a movie I saw called Men In Black and the icon reminds me of Sans or Papyrus from Undertale. I got my uniform if I ever get stuck on one of those survival games where you have to lie or con your way through! I actually laughed out loud when I read that Kyubey was a class of character now! That’s good advice, that is! Hehehe, that sounds like a funny motto. Hehehehehehehehehehehehehehehehehehehe, that sounds like a funny motto. I love cats! I have a gray tabby but it’s the only one cat we have…. sad. @People who constantly have their eyes closed: Isn’t that just a subcategory of the smiler? There are people who keep their eyes closed and don’t smile all the time, but the archetype I’m thinking off here is actually pretty reliable. They tend to be conservative men, bad at expressing emotions. They’re big brothers, family patriarchs, farmers or miners, restaurant owners (traditionally Japanese; maybe sushi)… They do what they have to, and have fairly strict standards. They express embarrassment either by turning away or by touching their necks so their elbow sticks up (I’m sure you know the gesture; it’s also common with big mouths). They used to be more common up until the nineties maybe early 2000s: think Brock from Pokemon. However, if they’re permanently smiling and keep their eyes closed at all time… it’s as Irina says: just hope their eyes don’t open on you. I can see why you would think so, Irina. Depending on the situation, sometimes I smile with my eyes closed too. Though, sometimes it’s completely accidental and I don’t even think about it. The unemotional kuudere. Never frown and never smile so they have a perfect wrinkle-free face forever. You will never figure out what is going on inside that head, whether it be a perfect vacuum where the feelings belong or they are quietly deciding how to butcher you and which cuts of meat will be the best. But aren’t kuuderes and danderes generally not dangerous? You never know. That’s scary. They might be a synthetic human trying to get you to knock them up. You forgot the character who always seems to have their eyes closed. True – thankfully you have a warning sign. If they open their eyes…it’s all over…. So don’t trust any anime characters? Got it! Next story Anime Winter 2019 – Week 5 Roundup!